At Cater For You we stock a wide range of food packaging to help meet the needs of many different catering and packaging requirements. We aim to sell all our packaging in the smallest possible pack sizes to help out our smaller customers but offer bulk discounts on all products for our larger ones. Our food packaging range continues to expand with new items regularly added. Please browse the various categories below for more information on the types available including leakproof, microwavable, oven traditional food packaging and the latest environmentally friendly packaging ranges. 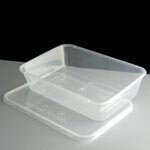 We offer a range of plastic, foil, cardboard and polystyrene containers with lids, ideal for food on the go. 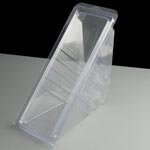 We offer a range of plastic hinged sandwich wedges in a variety of different sizes. We offer a range of paper and plastic bags in a variety of different shapes and sizes. Our packaging for take aways includes the classic plastic, foil, and polystyrene foam containers as well as cardboard noodle and pizza boxes and biodegradable options where available. All of our food packaging comes from BRC and ISO accredited factories and companies to ensure that all products are made from the best food grade materials and are ready to use straight from the box. 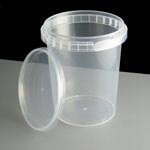 A lot of our plastic products are suitable for use in the microwave and are labelled up as such however we also stock products that are suitable for conventional ovens which are made from foil, plastic and cardboard.